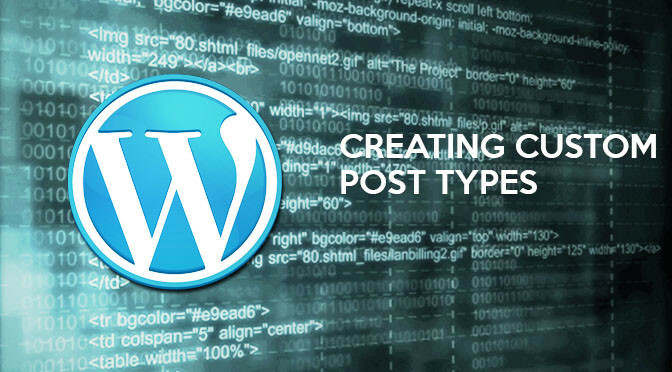 Short and simple guide to creating a custom post type for a WordPress theme or plugin. There are a few guides out there that will take you through the in’s and out’s of register_post_type() such as smashingmagazine.com so I will keep this short and sweet. First of all have a quick read through the wp codex for registering post types to get a general idea of what is available to you. Head over in your functions.php or your plugins main file and create a new function and dump in this code. The array $labels is used to configure all the text used in your new custom post type, such as buttons and headers as well as any default content on the page. The $args array does all the work for configuring how your post type works, for a full description on what each of these options does head over to the arguments section on the wordpress codex page. Really the most important bit you need to know for a standard custom post type is the supports option. That is just about all that you need to setup your very own custom post type, all that’s left is to have wordpress load your code. The last line in the previous sample is the wodpress function that creates your new custom post type which takes in two parameters. The first is the name of your post type, this has to be all lower case with no spaces, standard wordpress convention for naming something. This is whats used to refer to your custom post type in your theme or plugin. The second parameter is the arguments array you just created so make sure to include that. you can place this anywhere in your functions.php or plugin file but preferably just after the closing of the function it initializes. This just tells wordpress when to run your function. Hopefully that gives you enough information to get started with your own custom post type if not leave a comment and I will be more than happy to help you sort it out. I will be writing about taxonomy creation and metaboxes next, these will help increase the functionality of your custom post type so stick around for that.